On October 4th, Glenwood Landing began its month long C.R.E.W. (Curious Readers Enthusiastic Writers) festival with an exciting school-wide assembly celebrating 28 years of C.R.E.W. This year, the CREW committee proudly stated that the theme was “Laugh into Literacy” inspired by guest author Darren Sardelli. Students will be encouraged all month to read books about fiction, poetry, non-fiction, biographies, and science fiction, just to name a few and write about them! The enjoyable ceremony was filled with songs and a presentation summarizing all of the educational activities that will take place during the month of October 2016. “St. Jude StoryQuest, which includes raising money for children with cancer. Last year, approximately $1,000 was raised by GWL for this important cause. C.R.E.W. Button Contest, a favorite activity where each student participates in drawing the new C.R.E.W. button. During the opening ceremony, the best student buttons from each grade were selected and the children were called up onstage. 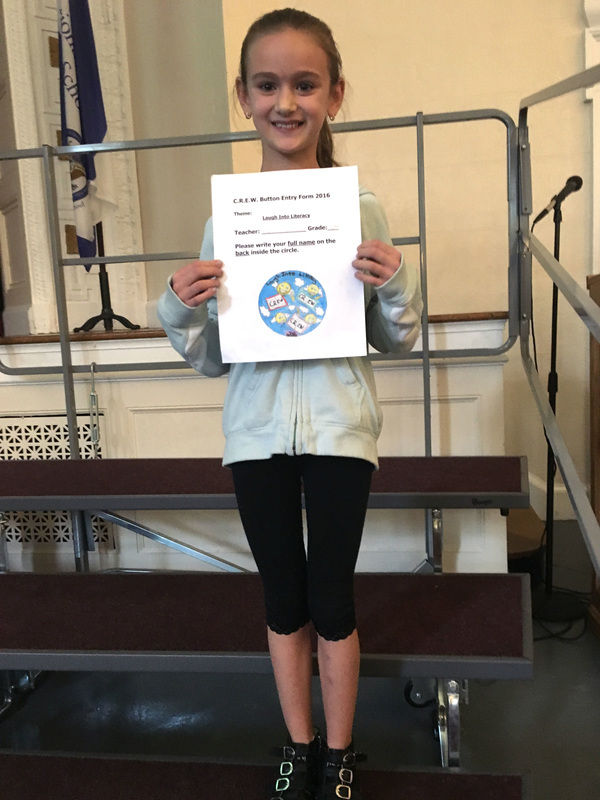 Additionally, the school-wide button contest winner was revealed, fifth grader, Mikayla McBride! Congratulations to all of the students for creating such beautiful C.R.E.W. buttons! While students read and write all year long, the month of C.R.E.W. reinforces these skills by continuing to focus on genres including poetry, fairytales, non-fiction, personal narratives, biographies, memoirs, and picture books. Additionally, many, many library activities will take place throughout the month. During C.R.E.W., students will be challenged to read more books than the year before! On October 31st, there will be a closing ceremony to culminate the C.R.E.W. festival. Many thanks go out to the teachers, staff, the C.R.E.W. committee, and the Glenwood Landing School-Community Association (SCA) who are all essential in the success of this event.